Dogs love to chew on bones, shoes, sticks and unfortunately for some owners, even on furniture. While we may overlook and turn a blind eye on some of these chewing favorites we cannot afford our canine friends to gnaw on our expensive maple dinner table or our precious ebony computer desk. Wood seems to be a chewing favorite as it is the right texture to allow your dog’s teeth to sink in and scrape off some small fragments or even take out a heartier chunk. Fortunately there are various approaches that can help reduce and hopefully put an end to this annoying dog chewing behavior. Some may work, some may not, but in most cases a combination of each will do the trick. It may be helpful to fully understand why dogs chew in the first place to better assess the situation. Of course, puppies chew because they are teething and chewing helps them sooth the pain effectively, however, puppies chew also because just as human toddlers that is simply the way they explore the world. If your dog is way past his puppyhood age then you will consider other causes. Sometimes dental issues may cause dogs to seek items to chew on providing relief to the gums, however more often than not chewing has a psychological base. Boredom, anxiety, frustration, or excess energy may be common triggers. Some dogs suffer from separation anxiety and once left alone at home will resort to chewing half a house apart. If you recognize any of these behavior issues try to address them properly. A dog behaviorist may be necessary for severe cases. However, many times all it takes is taking your dog out more to release the extra energy and help relieve the boredome. This is usally the path towards happier and more relaxed dog. An owner should also consider that in nature and in the wild, chewing is a normal canine hobby. Just as we read a book, or watch t.v. dogs like to endure in a nice, relaxing chewing session. It appears that some breeds of dogs are more prone to chewing than others. For mild chewing cases such as puppies tetthing or adult dogs that simply need that extra stimulation, the below tips can prove to be very helpful. This psychological approach will tell your dog what not to chew on while offering alternate options. It works because it is a positive way to handle the issue, and dogs seem to learn better this way. Next time your dog goes for his favorite table leg, catch him in the act and startle him by saying “Aaah-aahh!” clapping your hands. Immediately, right after, toss him a chew toy. Once he chews it tell him “Good boy” in a praising matter. All dogs should be familiar with the “drop it” command, it can literally save a dog’s life by telling him to drop something before he/she ingests it. I have used it several times and have spared my dogs from eating various potentially dangerous objects. Many obedience training instructors teach this command in their classes. You can try to teach it yourself by tossing a toy to your dog. Your dog picks it up and you then say “drop it” while showing your dog a treat. The dog will immediately drop the toy and you will give the treat. Repeat several times. At some point do not give the treat any longer but rather pat him on the head praising him. Then try this command next time your dog is about to chew your favorite furniture. He should promptly stop chewing and come towards your direction. Hand him his favorite toy and praise him lavishly for taking it. Your dog may be a big chewer necessitating stronger chew toys. Invest in some “heavy duty” chew toys such as Nylabones or pretty durable rubber toys. Try to stay away from rawhide bones that may cause choking and even intestinal obstructions. Stay away as well from squeaky toys as many dogs have gone through the toy and ingested the squeaker requiring major surgery. 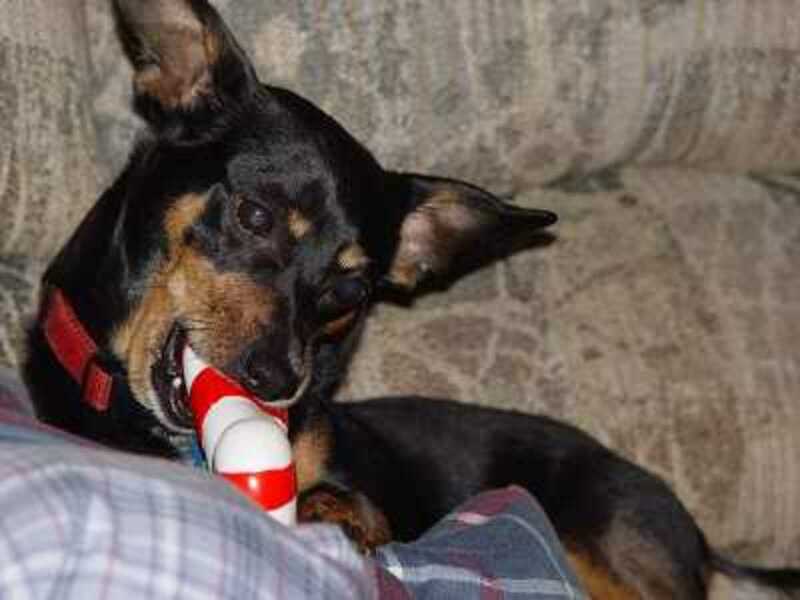 Kongs are very durable and great as they may be stuffed with peanut butter or other goodies. They may also be frozen to relieve puppy’s teething pain. If you are not supplying the right chew toys that meets your dog’s chewing requirements he/she may easily find your furniture much more appealing. Try to make the toys more atrractive by routinely alternating them to prevent boredom. A pharmacist in 1960 invented this famous product that should deter dogs from chewing up their itchy skin or any other surface. It is the strong bitter flavor that will discourage your dog from chewing your precious furniture. Simply spray the product on all the surfaces you wish to be left undisturbed. The spray is harmless and will not stain your furniture. It can be found in any major pet store. Curiously though, it appears that some dogs are not bothered by the flavor and some have been reported to even like it! Patience and consistency are the key factors leading to success. You need to ensure that each and every time your dog heads for your wood coffee table you correct him promptly and hand him a chew toy. This may be pretty annoying at first, but gradually you should notice the attempts tapering off. It is vital that you and your family members are all on the same track, ensuring that everyone will correct in the same correct matter. All it takes is a couple of episodes that are not corrected promptly to positively reinforce the behavior and return. If you are unable to watch your dog it would be in your best interest if you would crate him until you can trust him alone. Remember: corrections must occur within 5 seconds in order to be fully effective. Dogs do not have the same attention spans as humans do. If it takes longer than 5 seconds your dog may no longer know what he did wrong and will not be able to associate the correction with the wood chewing. The physical causes may need addressed by your vet. Your dog may need a dental cleaning or have a gum issue. The psychological causes may need addressed by a behaviorist if the above remedies do not seem to work. A dog behaviorist may help you learn tecniques to better train your dog and may recommend some medications. Do not try to address behavior issues on your own. For instance, if you tell an anxious dog to stop chewing furniture it may start chewing it’s own paws or chasing its tail instead. Chewing can be an annoying habit to get rid of, after all teeth are created for the main purpose of chewing. It is a real fact that dogs will always chew. The main deal is teaching what he can and what he cannot chew. Hopefully some or a mix of the above remedies will help your dog stop chewing on your favorite furniture. If he ever would go back to his antics, do the same and go back to the basics. However this should be unlikely if you and your family have been patient, persistent and consistent. So hopefully let’s knock on wood, pun intended!